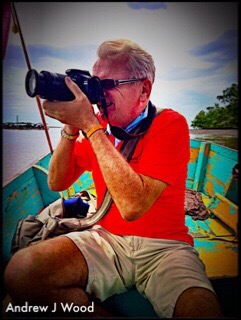 British born author Andrew Wood shares his Thailand travel secrets after almost a quarter of a century living in “The Land of Smiles”. Weekends seem to come and go so quickly. Life’s too short to waste them. So what to do to escape the city for a fun weekend, without travelling hours and hours? That was the question we applied ourselves to and came up with the answer of driving to Amphawa district just 80 km south-west of Bangkok. We were travelling as a small group of eight friends. We left Bangkok by minivan and arrived at The Grace Hotel Amphawa; the journey took just one hour and 20 minutes. Located on the banks of the Mae Klong River, the hotel surprised me… in a good way. It had Jacuzzi baths; it was modern, clean and uncluttered. 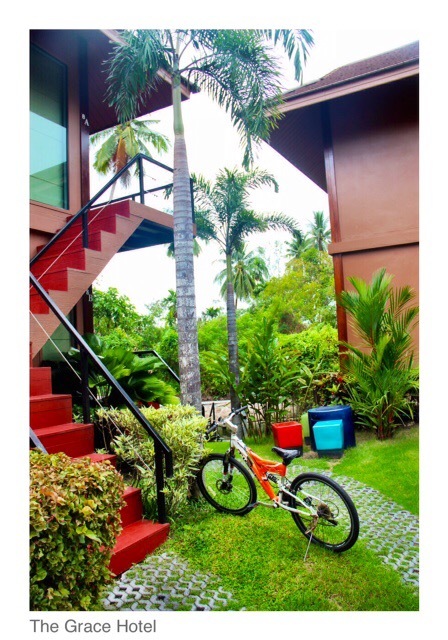 We had AC (air conditioning), Wi-Fi, a mini fridge, TV’s, large balconies, outdoor furniture and big comfortable beds. The hotel is a long riverfront strip, made up of villas that stretch from the entrance to the riverside. Here you find the restaurant and the outdoor swimming pool. It was late afternoon and we decided that we would shower, change and meet for drinks on the balcony of one of the villas and then have an early dinner at the hotel’s riverside restaurant. I ordered Nam Prik Ong a famous Thai dish that is made from minced pork, tomatoes and chilli. I’ve tried this dish many times before but never had it quite as good as this. The dish resembles warm Bolognese sauce with fresh vegetables to dip. This one was so good I ordered the same dish on two separate occasions. 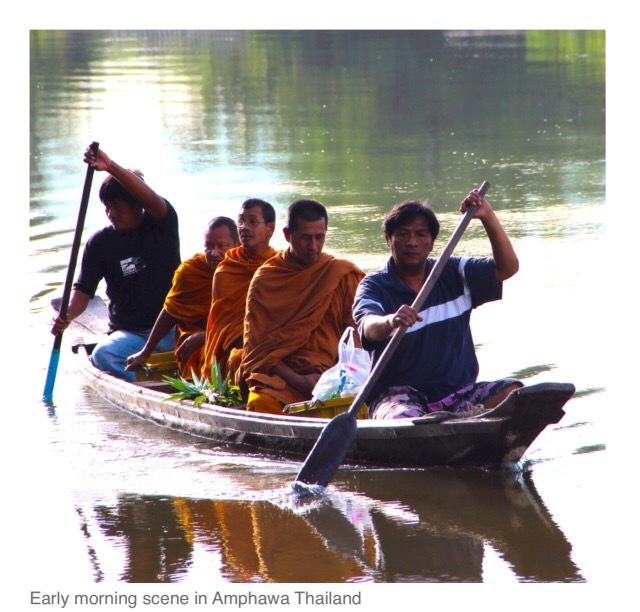 The following day we rose early for breakfast to participate in a lovely alms ceremony for the local monks. They arrived at the hotel by flat-bottom boat, silently paddled by two oarsmen. 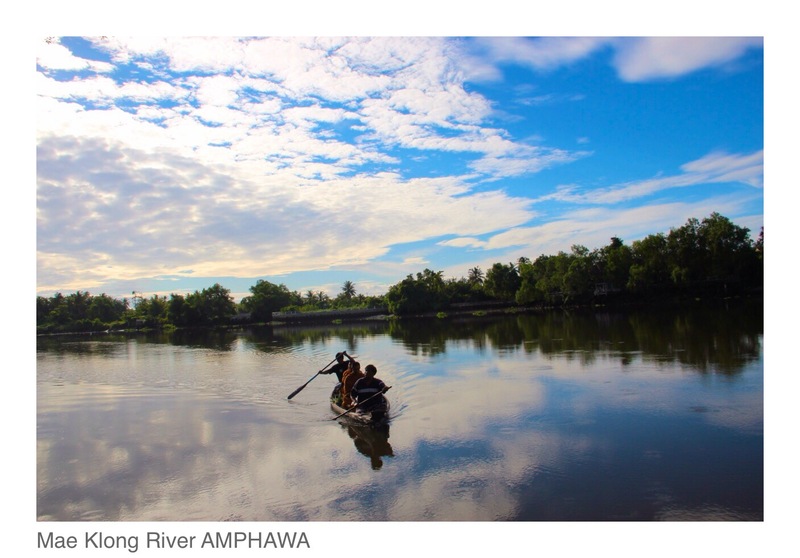 It was a spectacular morning, white fluffy clouds on a blue background, with the still waters of the Mae Klong River passing by. We made our offering to the monks of food along with incense, candles and flowers. It was a wonderful photogenic experience, the memories I shall keep for a very long time and a photo opportunity par excellence. 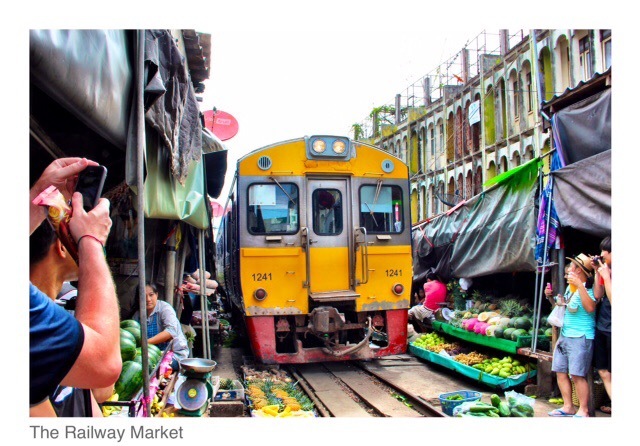 Next stop a short 15-minute drive into Amphawa town itself to visit the Mae Klong Railway Market. We followed the river downstream. You quickly get the sense that the river is as important to the area as the roads we travelled on. The market is well-known and famous as the market that suddenly has to make way for railway locomotives. They pass right through the market stalls that are pitched on the side of the tracks. We were able to witness the arrival of the morning train. A scene repeated eight times daily. 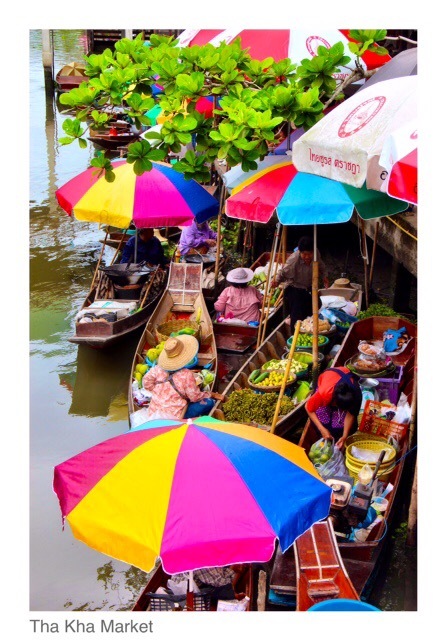 In Thai the market is called Talad Rom Hoop – which, roughly translated, means ‘close the umbrella market’. Which is exactly what happens when the train approaches, the umbrellas and tarpaulin awnings that shade the vendors, with one pull of a rope, are whisked away. With another pull, the awnings are returned after the train passes by to carry on as before. The market has been in operation since 1984 and is a popular stop for all visitors to Amphawa. From there we then moved further downstream by van towards the mouth of the river. 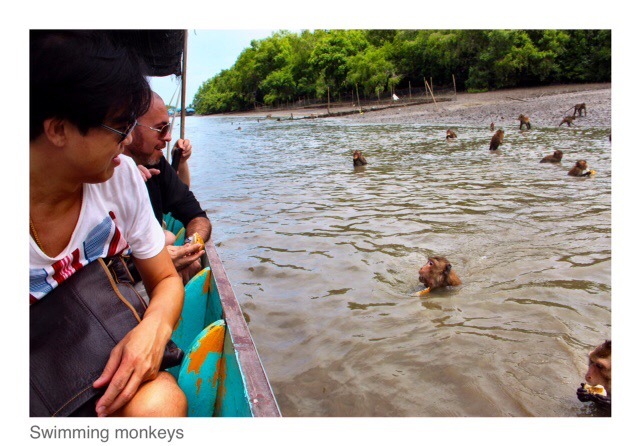 We switched our mode of transport to a longtail boat and meandered through a small canal, Khlong Khon, into the main estuary which was lined with mangroves and teaming with birds as we headed off to see a troop of swimming monkeys. 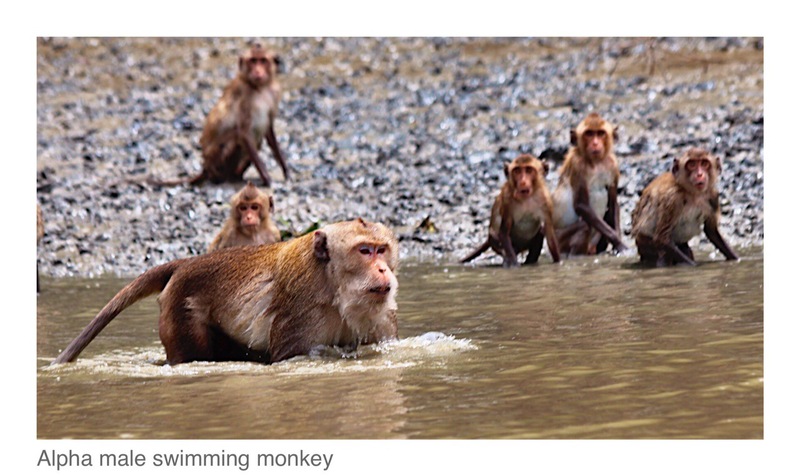 As we drew near a wonderful sight unfolded as we sat in the middle of the river – the monkeys ventured from the forest onto the river banks in anticipation of the fruit we had brought. Clearly a boat of people had a kind of Pavlovian response – feeding time! They kept coming out of the mangroves, many carry babies. The bolder (AKA hungry) swam right up to the boat and clinging on, with their big brown eyes only inches away from you, that said ‘feed me’. We did. Then it was time to feed ourselves at Don Hoi Lod, located in Samut Songkhram close to Amphawa. Don Hoi Lot is a famous tourist attraction. It is a sandy bar on the mouth of the Mae Klong River. It was formed by the sedimentation of soil and mud and is rich with seafood and shellfish – clams, especially razor clams (Hoi Lot) from which the area derives it’s name. The seafood here is delicious and cheap and we were all ready for an ice cold beer. 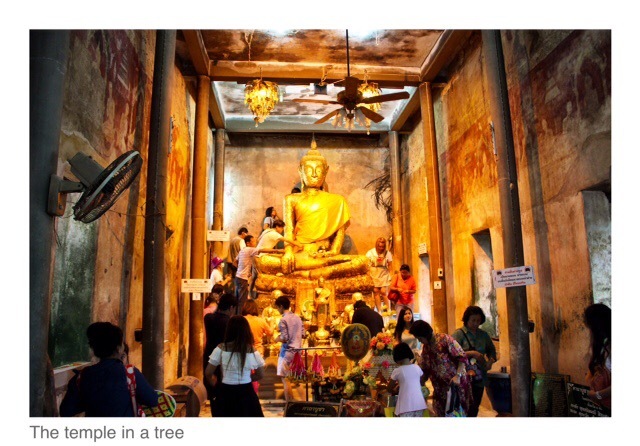 Then we were off again to one of my favourite temple visits – the ‘temple in a tree’ at Wat Bang Kung. One of the more interesting temples which dates back to the Ayutthaya Period in the 18th Century, it is also known as Bot Prok Pho. Wat Bang Kung is famous for the small temple that is completely enclosed within the roots of a giant Banyan (Bodhi) tree. The roots look like pillars supporting the temple within, creating an amazing space with a serene and surreal atmosphere – nature’s architecture. A lovely place to pay respect to the Buddha image inside. At the same site lies the memorial to Bang Kung Camp, once a strategic naval outpost. Back in 1767, after the defeat of the old Siam capital of Ayutthaya by Burmese forces, General Taksin brought his navy down here after Burmese ships blocked the route to the gulf. He led his troops to re-take Ayutthaya and eventually became King Taksin the Great. From there we went on to the Church of the Virgin Mary. 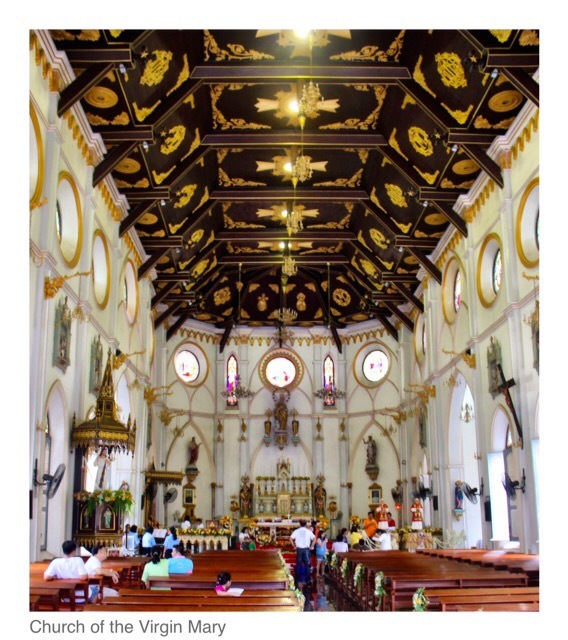 The church is a delightful huge gothic building, a real treat and a surprise to find such a grand building here in Amphawa. It dominates the landscape. I thought I was in Chartres in Northern France. 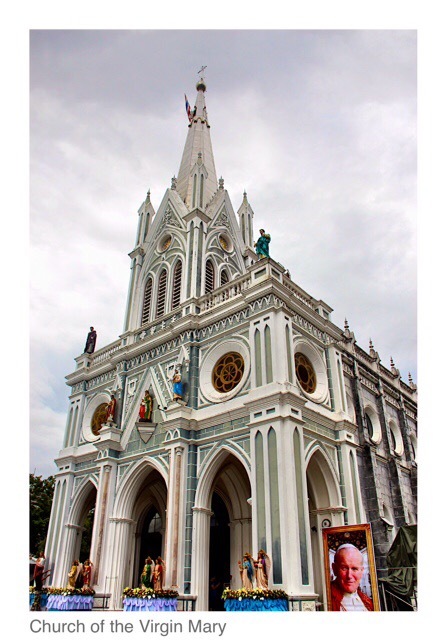 It is an important place of worship for Christians in Thailand and is the oldest church in the country. Christianity was first introduced to Thailand by European missionaries and now represents 1.2% of the national population, which is predominantly Buddhist. The Church of the Virgin Mary was constructed in 1890 by Father Paolo Salmone, a French Missionary. The construction of the church took 6 years. Built in French Gothic architectural style. The windows are decorated with beautiful stained glass, and ornate statutes decorate both the interior and exterior. The chapel has a beautiful wooden vaulted ceiling which is richly gilded. 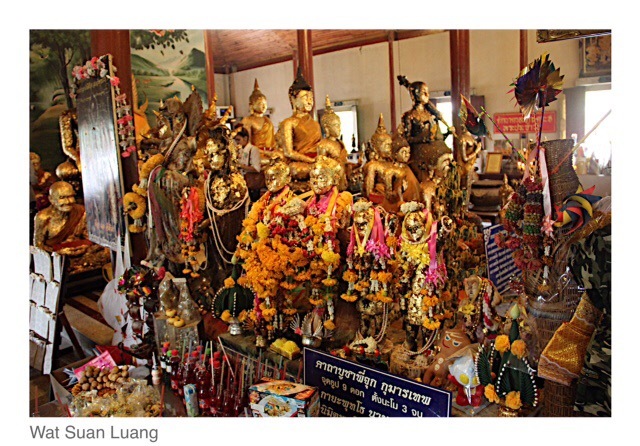 Next we stopped to visit Wat Suan Luang a temple with a lucky boy spirit – a kumanthep named P’Jook – which followers believe can protect against evil spirits and bring good luck. It’s a beautiful small temple and includes a monastery, located on the banks of the river. The focus of devotion being the Buddha images from the nine major temples in Thailand and two small 1-metre-high images of a boy and his sister with top knot hair, thought to be 200 years old. After returning to the hotel for a quick wash and brush up, we set off again in the early evening for the famous Amphawa floating market, an authentic working market open from 12 noon to 2000 hours on Fridays, Saturdays and Sundays and public holidays. Make sure to come early and spend a few hours here. The air is heavy with wonderful aromas from the numerous food stalls (delicious!) and local music adds a background buzz. The market takes place along the walkways of Amphawa Canal, a small tributary of the Mae Khlong River. It can get busy so prepare to move quickly with light clothing, good shoes and your camera. It’s one of my favourite markets. We took a longtail boat at the market to see the fireflies along the river. I had heard so much about nature’s Christmas tree lights and wondered if they would live upto expectation. They certainly did! It was wonderful. The fireflies are amazing and they all flash in unison tree by tree. How they synchronise like that, I’m unsure, but I thoroughly enjoyed this unique sight. 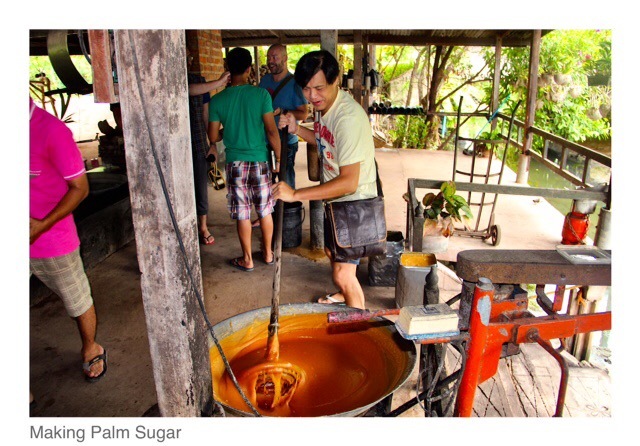 After a good dinner and overnight at our hotel, we set off early the following day to watch palm sugar being made in a home ‘farm factory’. 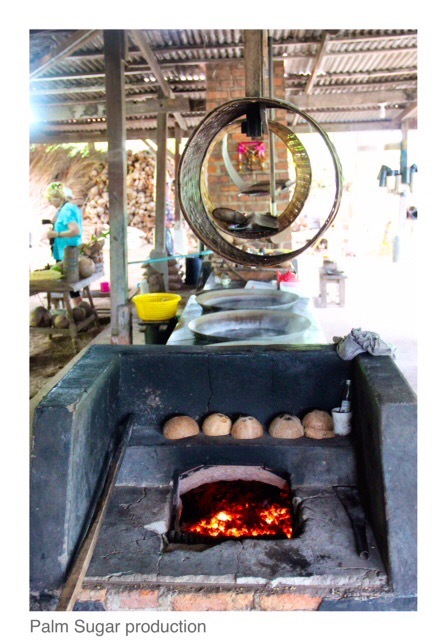 The sap of the coconut palm is reduced to make a caramel brown sugar often used in Thai cooking and Thai desserts khanom. This was a real delight. The ‘factory’ is tucked into a small farm at the side of the road covered in trees and plants and very local in appearance. We watched as the sap was reduce by boiling into a toffee-like consistency. After cooling it’s package and sold locally. Then we headed off to another ‘secret’ – the Tha Kha floating market. It’s not large, however, it’s very easy to get around and being a canal market means you can easily walk around without the need to get on a boat. What to do here? It’s very photogenic and a good place to walk around and shop. The food is fresh and delicious, cooked à la minute right in front of you. The market is a weekend (Sat and Sun) market and only operates in the morning from 0600 hours to 12 noon, and from what I could see, used to buy and sell produce to the local population, which added to it’s charm. Yes tourists are factored in and small stalls cater for the souvenir hunters and the thirsty! 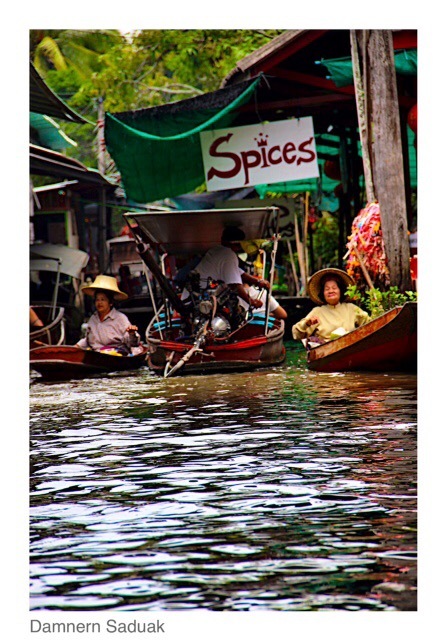 As we were so close, we decided to also visit Thailand’s iconic Damnern Saduak Floating Market. It’s the largest and most chaotic of all the floating markets. It was a Sunday morning and the market was very busy and very crowded. However, to be honest, it was my least favourite of the three markets we visited. On arrival we were immediately ensconced in a narrow canal and jostled and hurried. It felt cramped. The canals or klongs are filled with flat-bottom boats piled high with fresh produce, each jockeying for position and paddled by ladies -very colourful, very unique, and great for photographs. I started to hate the longtail boats though with their huge truck engines and drive-shaft propellers. They became a nuisance to me, up close they were to be endured not enjoyed. They were noisy and belched out fumes and are much too ‘long’ to easily navigate the narrow canals. Paddle power was the way to go and we spent an hour being skilfully transported around the klongs, not by horse-power but human-power. Andrew lives in Bangkok and is a Director of Worldwide DestinationsAsia Co www.wdath.com and is the former President of Skal International Thailand. Not far from BKK (1 hour) such a special and unique place to see for all visitors to Bangkok and Thailand.